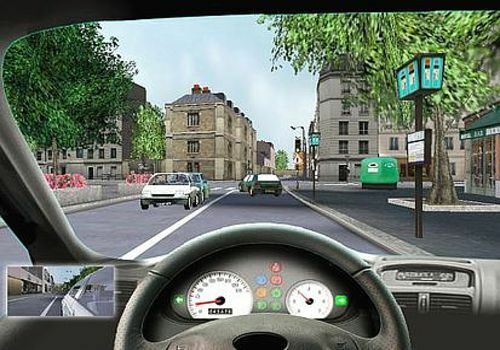 3D driving simulator is a perfect complement to your driving hours with your driving instructor. This software involves 12 lessons focused on specific topics such as mirror control, priorities, blind spots, use of turn signals during a change of direction, and parking. It also includes the main lines of the highway code, namely speed limits, traffic signs... in short, essentials when you are about to get behind the wheel. 3D driving simulator has the advantage of showing you all aspects of driving by making you drive virtually day and night in all the places you may encounter in reality: city, countryside, highway, etc. To do this, you can use your keyboard, a steering wheel with pedals or a joystick. You can also count on the advice of the virtual instructor who will accompany you during all the stages of your training. Would you like to pass soon or revise the road traffic regulations exam? Discover our 100% free software practical road code! It includes 4 sets of trap tests, 4 mock exams, and dozens of questions about signage, speed, vehicle and more. With the content of the "Road Traffic Regulations 2010" demonstration version, you have a set of tools at your disposal to successfully review and pass the road traffic regulations. Software developed by road training professionals. Prepare for the road traffic regulations and driving licence exams intensively with the Deluxe Driving School software. The latter includes 100 lessons, 3000 questions, and several tips to get your code and the famous pink paper, which makes all candidates dream. A complete and well thought out software for an optimal preparation for the examination of the highway code, in 400 tests and 4 modules.